Definition at line 85 of file CCopasiXMLInterface.h. Definition at line 91 of file CCopasiXMLInterface.h. Definition at line 271 of file CCopasiXMLInterface.cpp. Definition at line 277 of file CCopasiXMLInterface.cpp. Definition at line 158 of file CCopasiXMLInterface.cpp. References attribute, character, encodeATTRIBUTE(), encodeCHARACTER(), encodeNONE(), encodeSTD(), none, standard, and void(). Referenced by CXMLAttributeList::add(), CCopasiXMLParser::UnsupportedAnnotationElement::end(), CCopasiXMLParser::MiriamAnnotationElement::end(), CMathMl::fixName(), CCopasiXMLParser::onCharacterData(), saveData(), CXMLAttributeList::set(), CXMLAttributeList::setValue(), CCopasiXMLParser::UnsupportedAnnotationElement::start(), CCopasiXMLParser::CommentElement::start(), and CCopasiXMLParser::MiriamAnnotationElement::start(). End saving an XML element to the ostream started by startSaveElement. Definition at line 368 of file CCopasiXMLInterface.cpp. Referenced by CCopasiXML::save(), CCopasiXML::saveAnnotation(), CCopasiXML::saveBoundingBox(), CCopasiXML::saveCurve(), CCopasiXML::saveCurveElements(), CCopasiXML::saveFunctionList(), CCopasiXML::saveGlobalRenderInformation(), CCopasiXML::saveGlobalStyle(), CCopasiXML::saveGroupElement(), CCopasiXML::saveGUI(), CCopasiXML::saveLayoutList(), CCopasiXML::saveLinearGradient(), CCopasiXML::saveLineEnding(), CCopasiXML::saveListOfGlobalRenderInformation(), CCopasiXML::saveListOfLocalRenderInformation(), CCopasiXML::saveLocalRenderInformation(), CCopasiXML::saveLocalStyle(), CCopasiXML::saveModel(), CCopasiXML::saveModelParameter(), saveParameter(), CCopasiXML::savePlotList(), CCopasiXML::savePolygonElement(), CCopasiXML::saveRadialGradient(), CCopasiXML::saveRenderCurveElement(), CCopasiXML::saveRenderInformationDefinitionElements(), CCopasiXML::saveRenderTextElement(), CCopasiXML::saveReportList(), CCopasiXML::saveReportSection(), CCopasiXML::saveSBMLReference(), and CCopasiXML::saveTaskList(). Implemented in CConfigurationFile::CXML, and CCopasiXML. Load information from a file. Definition at line 279 of file CCopasiXMLInterface.cpp. References CLocaleString::fromUtf8(), load(), and mPWD. Save information to a file. Definition at line 291 of file CCopasiXMLInterface.cpp. References CLocaleString::fromUtf8(), mPWD, and save(). Definition at line 305 of file CCopasiXMLInterface.cpp. References encode(), mIndent, and mpOstream. Referenced by CCopasiXML::saveFunctionList(), CCopasiXML::saveModel(), CCopasiXML::saveModelParameter(), saveParameter(), CCopasiXML::saveRenderTextElement(), CCopasiXML::saveReportSection(), and saveXhtml(). Definition at line 339 of file CCopasiXMLInterface.cpp. Referenced by CCopasiXML::saveColorDefinition(), CCopasiXML::saveDimensions(), CCopasiXML::saveEllipseElement(), CCopasiXML::saveFunctionList(), CCopasiXML::saveGradientStop(), CCopasiXML::saveGUI(), CCopasiXML::saveImageElement(), CCopasiXML::saveLayoutList(), CCopasiXML::saveModel(), CCopasiXML::saveModelParameter(), saveParameter(), CCopasiXML::savePlotList(), CCopasiXML::savePosition(), CCopasiXML::saveRectangleElement(), CCopasiXML::saveRenderPoint(), CCopasiXML::saveReportList(), CCopasiXML::saveReportSection(), CCopasiXML::saveSBMLReference(), and CCopasiXML::saveTaskList(). Definition at line 376 of file CCopasiXMLInterface.cpp. 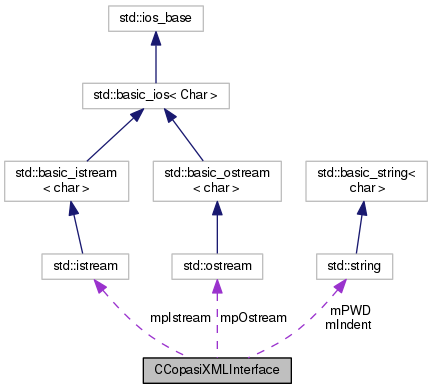 References CXMLAttributeList::add(), CCopasiParameter::BOOL, CCopasiParameter::CN, CCopasiParameter::DOUBLE, endSaveElement(), CCopasiParameter::EXPRESSION, CCopasiParameter::FILE, CDirEntry::fileName(), CCopasiObject::getObjectName(), CCopasiParameter::getType(), CCopasiParameter::getValue(), CCopasiParameter::GROUP, CCopasiParameter::INT, CCopasiParameter::INVALID, CDirEntry::isRelativePath(), CCopasiParameter::KEY, CDirEntry::makePathRelative(), mPWD, CCopasiParameter::Value::pBOOL, CCopasiParameter::Value::pCN, CCopasiParameter::Value::pDOUBLE, CCopasiParameter::Value::pEXPRESSION, CCopasiParameter::Value::pFILE, CCopasiParameter::Value::pGROUP, CCopasiParameter::Value::pINT, CCopasiParameter::Value::pKEY, CCopasiParameter::Value::pSTRING, CCopasiParameter::Value::pUDOUBLE, CCopasiParameter::Value::pUINT, saveData(), saveElement(), saveParameterGroup(), CXMLAttributeList::skip(), startSaveElement(), CCopasiParameter::STRING, CCopasiParameter::UDOUBLE, CCopasiParameter::UINT, and CCopasiParameter::XMLType. Definition at line 489 of file CCopasiXMLInterface.cpp. Referenced by saveParameter(), CCopasiXML::savePlotList(), and CCopasiXML::saveTaskList(). Definition at line 312 of file CCopasiXMLInterface.cpp. References mIndent, mpOstream, and saveData(). Referenced by CCopasiXML::saveAnnotation(), and CCopasiXML::saveReportList(). Start saving an XML element to the ostream. Call endSaveElement to conclude. Definition at line 349 of file CCopasiXMLInterface.cpp. Definition at line 357 of file CCopasiXMLInterface.cpp. Definition at line 245 of file CCopasiXMLInterface.cpp. Definition at line 133 of file CCopasiXMLInterface.h. Referenced by endSaveElement(), saveData(), saveElement(), CCopasiXML::saveModel(), saveXhtml(), and startSaveElement(). Definition at line 123 of file CCopasiXMLInterface.h. Definition at line 128 of file CCopasiXMLInterface.h. Referenced by endSaveElement(), CCopasiXML::save(), CCopasiXML::saveAnnotation(), saveData(), saveElement(), CCopasiXML::saveModel(), saveXhtml(), and startSaveElement(). Definition at line 138 of file CCopasiXMLInterface.h. Referenced by CCopasiXML::load(), load(), CCopasiXML::save(), save(), saveParameter(), CCopasiXML::saveSBMLReference(), and CCopasiXML::saveTaskList().